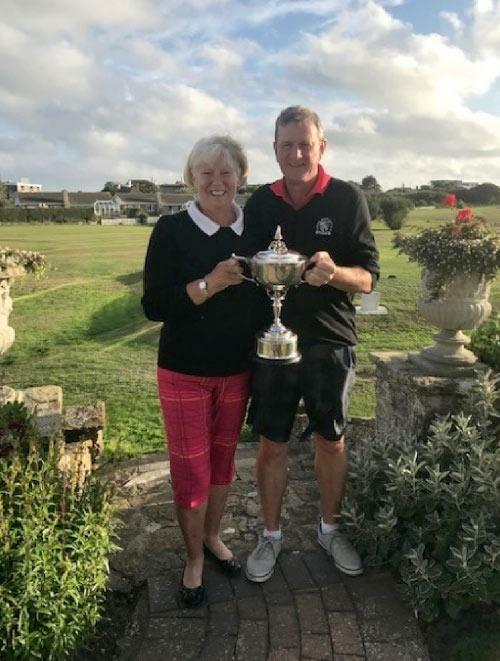 Inaugurated by the 9th Earl De La Warr in 1934 the Alexander Grant Trophy competition is the Club’s Mixed Foursomes Open competition held on the first weekend in September. The competition is over the whole week-end and every pair can play four rounds of golf. The first qualifying round is held on the Saturday morning and is a Mixed Foursomes Stableford round of 18 holes played off half combined handicaps from the white/red tees – maximum handicap for Men is 24 and Ladies is 30. Entries from higher handicapper’s are accepted, subject to availability but play off a 24/30 handicap. There is a maximum entry of 56 pairs for this competition. After the qualifying round on Saturday morning the top eight scores are placed into division A and play for the Alexander Grant Trophy. All other pairs are also placed into divisions B to G, each of eight pairs, according to the rank position achieved by their stableford score. The competition then adopts a foursome’s match-play knockout format to determine the winners and runners up in each division. The draw for each division is made at Saturday lunchtime and this is announced as soon as all morning rounds have been completed. Saturday afternoon sees the quarter final matches for each division with the winners of those matches progressing to the semi-final and final matches on Sunday in the morning and afternoon respectively. Losing pairs on Saturday afternoon and Sunday morning may enter a Foursomes Stableford Plate competition that takes place on Sunday AM and PM. The entry fee also includes lunch and dinner Saturday and lunch and afternoon tea on Sunday. The prize giving takes place on Sunday afternoon after all competitions have been completed. There are prizes for all qualifiers in Division A and for each Winner and Runner Up in all other Divisions. There are also subsidiary prizes for the Plate Competition. Will you steal the crown from Clive & Jill and be our 2019 Alexander Grant winners? And of course a contribution to prizes!